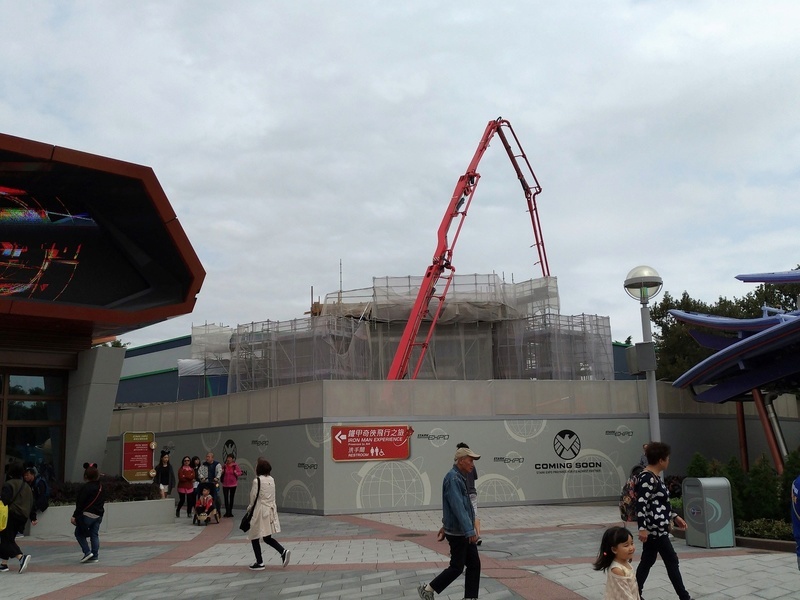 Guests at D23 Expo Japan 2018 this past weekend got a sneak peek at the thrilling new Marvel attraction coming to Hong Kong Disneyland – and we’re excited to share those new images with all of you today! 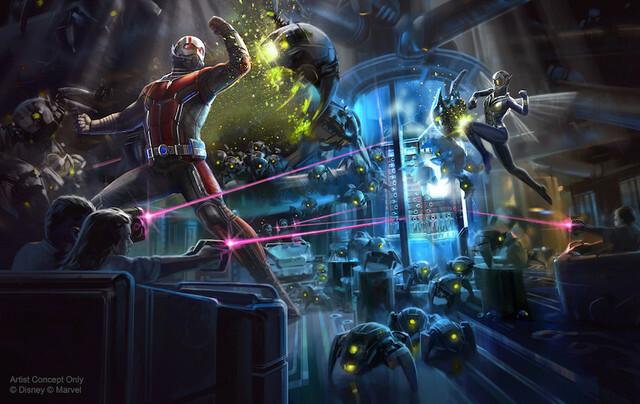 In the new attraction, guests will join Ant-Man and The Wasp to fight Arnim Zola and his army of Hydra swarm bots. 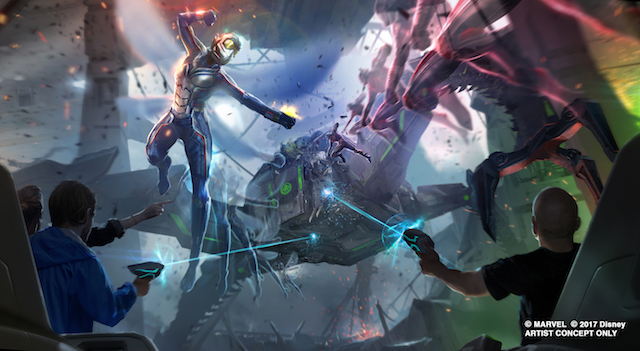 This will be the second Marvel ride-through attraction experience guests can only have at Hong Kong Disneyland – including the new Iron Man Experience, already the most popular attraction – and just one part of the resort’s multi-year expansion plan through 2023, which will also include an entire Marvel-themed area. Hong Kong Disneyland kicked off construction of the multi-year park transformation last October, and guests will soon see the first new experience open in May with the introduction of a brand new stage show in Adventureland, “Moana: A Homecoming Celebration” featuring the newest heroine from Walt Disney Animation Studios. Construction has also begun on the transformation of the castle, which will feature a new daytime show and nighttime spectacular. The expansion will also add an all-new, immersive “Frozen”-themed area where guests will experience new attractions and entertainment, including meeting the royal sisters Elsa and Anna. There’s so much coming to Hong Kong Disneyland, and we can’t to share more about what’s in store! L'attraction actuellement désignée sous l'appellation "Ant-Man and the Wasp" ouvrira début 2019. La seconde attraction annoncée est toujours prévue pour l'année 2023. C’est donc bien un ride basé sur Antman . Les autres Avengers seront pour le ride de 2023. Cela avait déjà été confirmé en octobre dernier (voir page précédente) et mentionné à nouveau ce mois-ci lors de la convention D23 Japan 2018 : L'homme-fourmi, la Guêpe et le S.H.I.E.L.D. combattront Arnim Zola et l'HYDRA dans la nouvelle attraction. Le visuel est de qualité, mais contrairement à DCA ou DLP il n'apprend pas grand chose. Pour cause, on connait les projets à venir pour HK. Mais les trois visuels sont vraiment de qualité. L'attraction sur Ant-Man et la guêpe avance à grand pas ! Bon sang, je dois avoir l'esprit mal placé, mais vous ne voyez rien au centre de l'image qui se dresse ?? Je ne comprends même pas comment ils ont pu sortir une affiche avec cette tour en plein centre ! Le nom de l'attraction qui remplacera Buzz Lightyear Astro Blasters et dont l'ouverture est toujours prévue pour 2019 est Ant-Man and The Wasp : Nano Battle! ! L'histoire : An ordinary visit to the S.H.I.E.L.D. Science and Technology Pavilion at Stark Expo at HKDL turns extraordinary as Guests are called to action. Riding in S.H.I.E.L.D.’s state-of-the-art vehicle, guests engage in a heroic battle, fighting alongside Ant-Man and The Wasp against Zola and his army of Hydra swarm-bots. Brand new attraction Ant-Man and The Wasp: Nano Battle! opening in March 2019 The fun continues year-round with immersive and all-new resort-wide experiences (Hong Kong Disneyland Resort - 18 octobre 2018). On sait depuis la mi-octobre que l'attraction Ant-Man and The Wasp: Nano Battle! 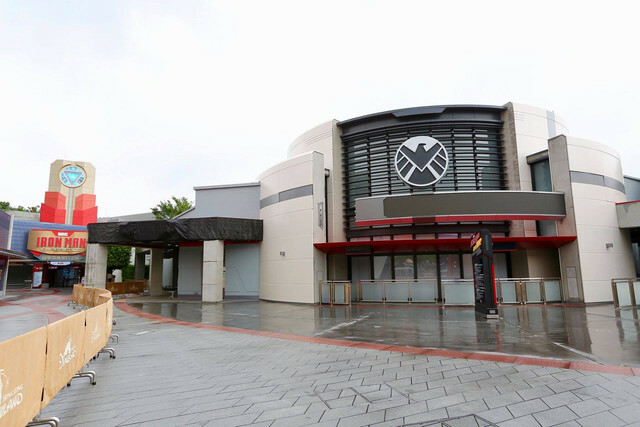 ouvrira en mars prochain, mais il est maintenant confirmé que la boutique Pavilion Gifts, situé dans l'aile Nord du S.H.I.E.L.D. Science and Technology Pavilion, ouvrira dès le mois de décembre ! Tony Stark chose Hong Kong Disneyland as the location for the Stark Expo a while ago to showcase his latest innovation with the world. To continue that mission, he has invited S.H.I.E.L.D. to set up the S.H.I.E.L.D. Science and Technology Pavilion in Hong Kong to demonstrate the latest and coolest technology that help achieve their goal in striving to “safeguard the world with science”. You can now see the exterior design of the S.H.I.E.L.D. Science and Technology Pavilion next to Stark Expo at Tomorrowland. The minimalist light-grey facade of the S.H.I.E.L.D Pavilion complements the logo and characteristics of S.H.I.E.L.D. and highlights the theme of science and research. “Pavilion Gifts”, located at the north wing of the building, will be the first facility to open in the pavilion in December 2018. 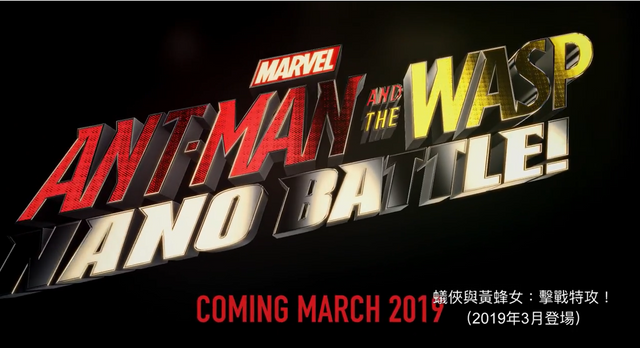 The brand new Marvel-themed interactive experience “Ant-Man and The Wasp: Nano Battle!” will be open in March 2019. Hong Kong Disneyland Resort - 29 novembre 2018. En effet, froid, vide, sans détails... Et le bâtiment de Iron Man derrière fait vraiment articiel... A voir en vrai. Je suis tout à fait d'accord avec vous, le bâtiment a l'air froid, sans âme, digne de notre "Place des Stars" aux Walt Disney Studios. Pavilion Gifts ouvre aujourd'hui vendredi 14 décembre 2018 ! La nouvelle boutique souvenirs propose des articles Marvel S.H.I.E.L.D et Ant Man and The Wasp. Nouvel aperçu de Ant-man and the Wasp. On y voit les nouveaux véhicules (très jolis je trouve) et quelques images de l'intérieur. L'un des intervenants blablate sur les technologies de CAO qui leur ont permis de fabriquer les éléments de scénographie "les plus fidèles jamais créés pour une attraction comme celle-ci". Pour illustrer son propos on nous montre des images de décors physiques éclairés à la lumière noire. Pour moi c'est le gros plot-twist de cette vidéo. Je m'attendais au vu des concept arts à l’intégration d'écrans et une interaction basée principalement sur eux. J'étais assez peu enthousiasmé par cette idée, parce qu'il est impossible d'utiliser la technique du "Squinshing" dans un ride Omnimover, du coup s'il y a des écrans (et il y en aura forcément quand même quelques uns), la perspective sera figée et l'intégration mauvaise. Mais là on reste clairement dans la lignée de Buzz Lightyear Lazerblast avec décors et ennemis physiques. Maintenant j’espère que ce sera plus réussi que la version Shanghai de Buzz qui est terriblement statique et redondante. L'attraction Ant-Man and The Wasp: Nano Battle! ouvrira le 31 mars 2019. 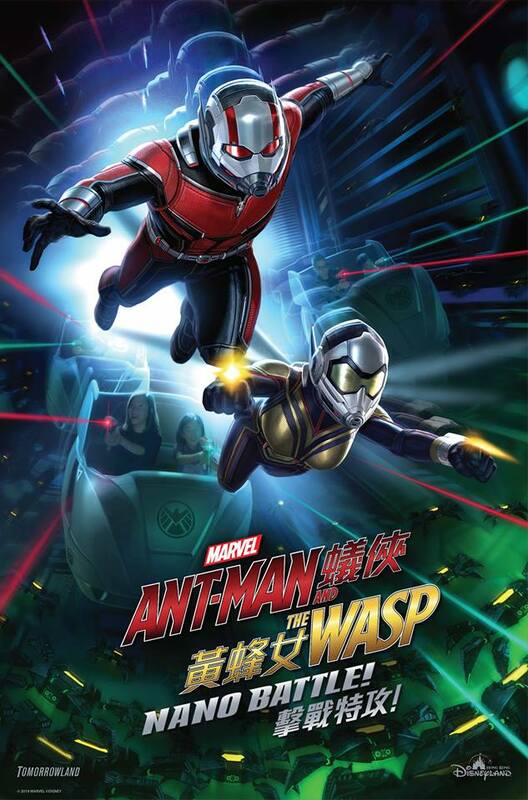 Hong Kong Disneyland Resort (HKDL) today revealed that its newest Marvel attraction, Ant-Man and The Wasp: Nano Battle!, will open on March 31, 2019. 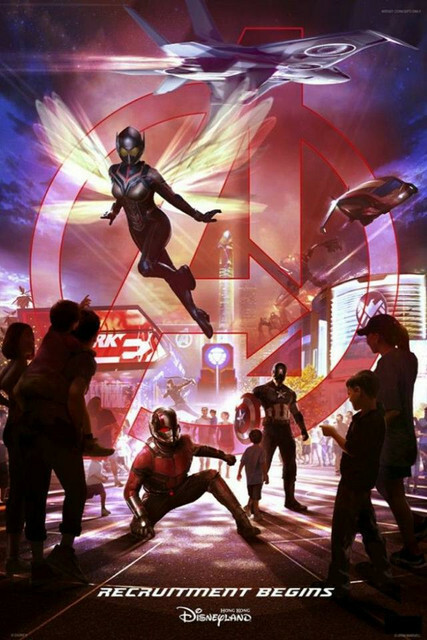 It will be the world’s first attraction featuring Ant-Man and The Wasp, as well as the first Marvel-themed attraction featuring a female Super Hero as a lead character. 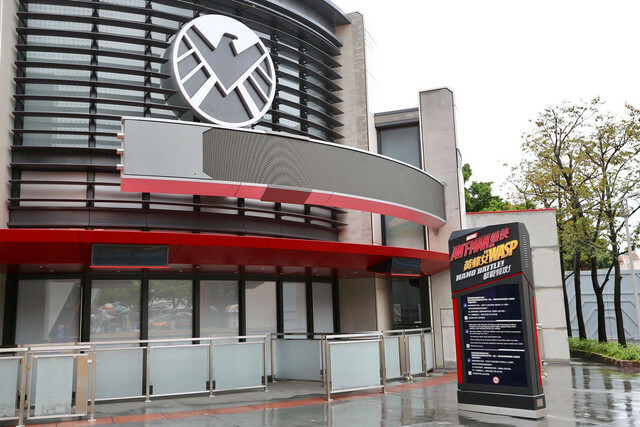 The long-anticipated launch marks HKDL’s second Marvel-themed attraction and the continued development of an ultimate hub for Marvel Super Hero action in the region, as part of the multi-year expansion. Ant-Man and The Wasp: Nano Battle! expands the epic adventure of Iron Man Experience, which has been consistently rated as HKDL’s most popular attraction since opening in 2017. 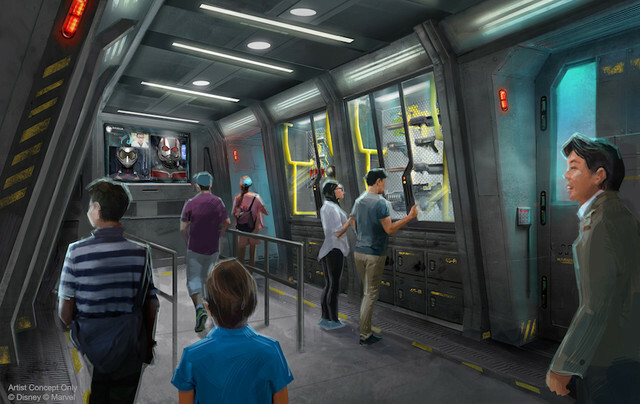 The new attraction will send guests on a critical mission with Ant-Man and The Wasp who have answered Iron Man’s call for support in defending Hong Kong against Hydra’s attack. This high-tech, high-energy interactive adventure begins with a visit to the S.H.I.E.L.D. 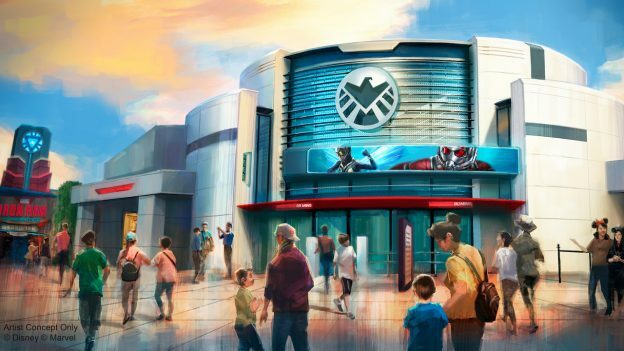 Science and Technology Pavilion, a newly opened facility at Stark Expo in Tomorrowland, set up to showcase S.H.I.E.L.D.’s latest technological developments. The seemingly ordinary visit is soon interrupted by Hydra, who has initiated a two-pronged attack in Hong Kong. Hydra not only is attempting to steal the Arc Reactor atop Stark Tower in Kowloon, Hong Kong, but its artificial intelligence Arnim Zola has sent an army of Swarmbots to infiltrate the S.H.I.E.L.D. Pavilion in order to steal a Data Core that contains highly confidential information. As he battles Swarmbots in Kowloon, Iron Man calls in Ant-Man and The Wasp to defend the pavilion, because only they can shrink down to get between the bots’ armor to destroy them from the inside. But with thousands of bots and only two of them, Ant-Man and The Wasp will need help. Guests at the pavilion are called into action. Aboard one of S.H.I.E.L.D.’s newest combat vehicles, D/AGR, the Defense/Assault Ground Rover (aka “the Dagger”), guests are issued an EMP Blaster and engage in a heroic battle alongside Ant-Man and The Wasp to defeat Zola and his Swarmbots. Marvel has a universal appeal with guests and fans of all ages and genders. In 2018, four of the top 10 blockbusters with the highest all-time global box office were from Marvel. “Ant-Man and The Wasp,” the sequel to “Ant-Man,” also opened as the top grossing movie in multiple territories across Asia Pacific. 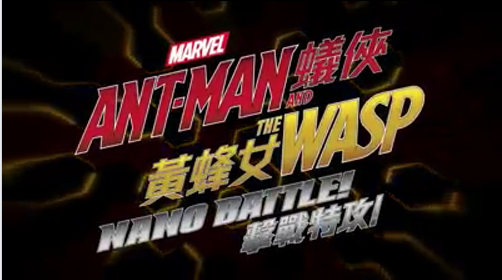 Created with classic Disney storytelling and close collaboration with Marvel, Ant-Man and The Wasp: Nano Battle! is a highly authentic and engaging Marvel experience. Director of “Ant-Man and The Wasp,” Peyton Reed and the movie production team were on board to film the media for the attraction; Paul Rudd and Evangeline Lilly, the stars of “Ant-Man and The Wasp,” joined the action by reprising their roles; and Christophe Beck, composer for the Ant-Man movies, also created the score for the attraction. 14 types of artefacts and research items from more than a dozen Marvel movies, TV show episodes and comics will also be on display, some of which will be exclusively exhibited at HKDL. The immersive, media-rich storytelling is enhanced by cutting-edge scenic illusion technology and a state-of-the-art gaming system was used to create an exhilarating, interactive experience. The all-new EMP Blasters deliver superb laser efficacy, accuracy and alignment, while targets of various sizes, difficulties and video effects create a complex, sophisticated game design that is both story-driven and challenging. With Iron Man Experience and the opening of Ant-Man and The Wasp: Nano Battle! HKDL will offer a complete Marvel-themed experience with two first-of-a-kind attractions, themed-merchandise, food and beverage and the Iron Man heroic encounter experience. Pavilion Gifts, the brand-new merchandise shop, opened in December 2018, provides more than 300 Marvel merchandise items and will introduce about 40 exclusive items themed to Ant-Man and The Wasp: Nano Battle! when the attraction opens in March. Guests will be able to take home special mementos that commemorate their heroic battle defending the S.H.I.E.L.D. pavilion alongside marvel Super Heroes. On the opening date of the new Marvel attraction, the admission tickets of the park will change with new design of Ant-Man and The Wasp. It will become a must-have collectables of avid Marvel fans! HKDL’s multi-year expansion project will bring many exciting additions to the resort, underscoring Disney’s commitment to the continuous growth of HKDL and Hong Kong’s tourism industry. In particular, a third Marvel-themed attraction is in the works as HKDL continues to expand as Asia’s ultimate Marvel hub. The live atmosphere stage show “Moana: A Homecoming Celebration,” the first entertainment offering under the expansion, opened in May 2018. HKDL will bring more Disney characters and stories, from Marvel to Frozen and Disney Princesses, to life through one-of-a-kind experiences in the coming years. Hong Kong Disneyland Resort - le 8 janvier 2019. Rien à dire, le teaser est génial ! L'idée de mettre Scott et la guêpe dans l'enseigne est excellente !